The raw emotions of the onlookers were palpable for 360 degrees. On the early morning of Feb. 24, Senior Airman Matthew Flores returned home from a two-month deployment to Bagram Airfield, Afghanistan, and he still had one more important mission to accomplish...proposing to his girlfriend Corinne Peterla. While everyone's tears were welling up, he was smiling widely and knew what he had to do. Flores, a munitions technician with the 177th Fighter Wing had just completed his second deployment after being deployed to Iraq in 2010. Before leaving to Afghanistan, he planned on proposing to his girlfriend when he got back and had asked his father to hold onto the ring until he returned. 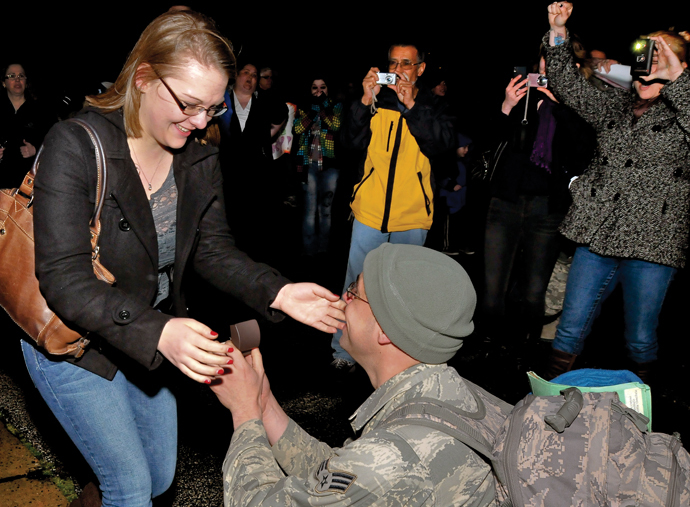 After stepping off the plane, his father passed him the ring, and then in front of all the other returning Airmen and their families, Flores dropped to one knee and proposed to Peterla.
" I couldn't think of a better time than as soon as I stepped off the plane," said Flores. Peterla's answer was "Yes."